Powerline networking kit continues to evolve in response to our needs. The first generation of adaptors focused on taking a single link between two plug sockets, but as more and more devices are network-aware - such as smart TVs, Blu-ray players, Xbox 360 and Sony PS3 games consoles and set-top boxes - so our physical network needs increase. 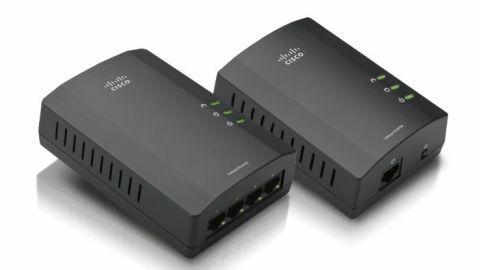 You could install a network switch in your current setup, but that's a little fiddly when there are far simpler solutions available, such as this kit from Cisco, the Linksys PLSK400 Powerline AV 4-Port Network Adaptor Kit. As the name suggests, this isn't just a simple point-to-point pair of powerline adaptors, since one of the devices in the kit boasts four 10/100Mbps Ethernet ports. This enables you to share your network, especially your internet connection, with up to four different units. The other adaptor in the kit is a straightforward single port unit, which is designed to plug into your router or network switch. The pair of adaptors make for an elegant solution in theory, although unfortunately the same can't be said for design of the Cisco Linksys PLSK400 units themselves. The main problem with the UK version of the Cisco Linksys PLSK400 kit is that the units have been designed without a clear understanding of how UK plug sockets work. Essentially the main unit, the 4-port PLS400 is big anyway in order to accommodate the four ports, but because of its orientation, the bulk of the unit extends upwards to obscure the socket power button. Plus all the icons and labelling is upside-down as well. Had the plugs been switched 180-degrees then all of these problems would have been resolved. When it comes to performance, the Cisco Linksys PLSK400 kit is behind more contemporary competition, although not as much as you would imagine. Indeed, the write performance in testing wasn't far off many 500Mbps units, such as the D-LINK DHP-501AV. The read performance isn't quite so on the ball though, rolling in a good 10Mbps slower. Even so, seeing as this is essentially last generation kit and is available at bargain basement pricing, slightly slower performance seems reasonable. Overall, the Cisco Linksys PLSK400 shows that the outgoing 200Mbps kit is still relevant, especially if you're a little strapped for cash. We aren't fond of the design of the adaptors themselves, since as you can't even reach the socket's power button when the units are plugged in, and the labelling is upside-down. But this kit does offer incredible value for money. Shop around and you might be able to pick them up for close to £42.